Slow slip events, a type of slow motion earthquake that occurs over days to weeks, are thought to be capable of triggering larger, potentially damaging earthquakes. In a new study led by The University of Texas at Austin, scientists have documented the first clear-cut instance of the reverse–a massive earthquake immediately triggering a series of large slow slip events. In November 2016, the second largest quake ever recorded in New Zealand — the 7.8 magnitude Kaik?ura quake — hit the country's South Island. 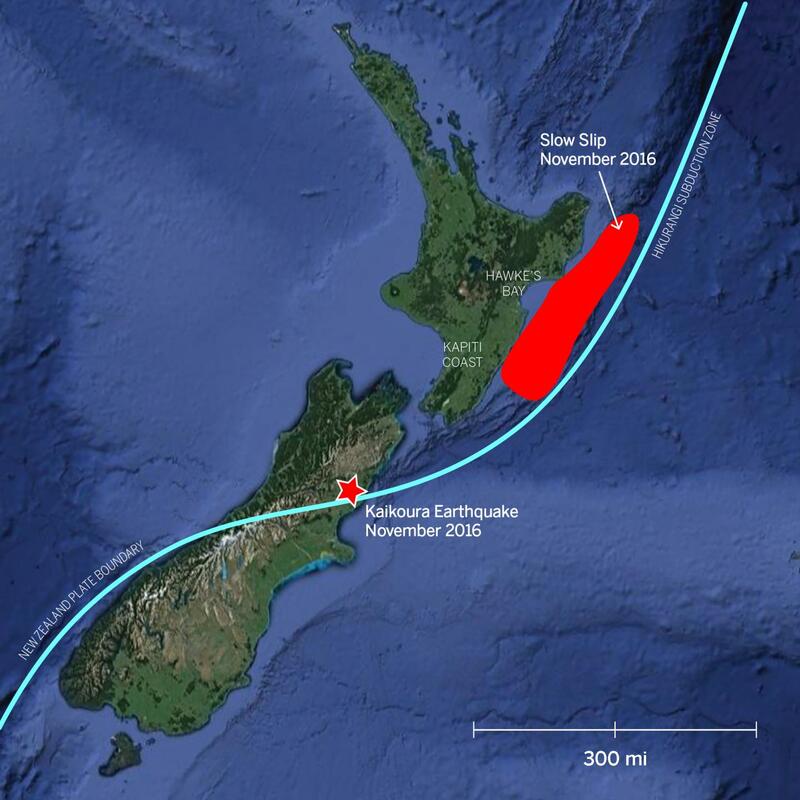 A GPS network operated by GeoNet, a partnership between GNS Science and the New Zealand Earthquake Commission, detected slow slip events hundreds of miles away beneath the North Island. The events occurred along the shallow part of the Hikurangi subduction zone that runs along and across New Zealand. The triggering effect was probably accentuated by an offshore "sedimentary wedge" — a mass of sedimentary rock piled up at the edge of the subduction zone boundary offshore from the North Island's east coast. This layer of more compliant rock is particularly susceptible to trapping seismic energy, which promotes slip between the plates at the base of the sedimentary wedge where the slow slip events occur.